The inaugural winners of the Sir Owen G. Glenn Study Abroad Scholarship will begin their funded experience abroad this week in the United States. 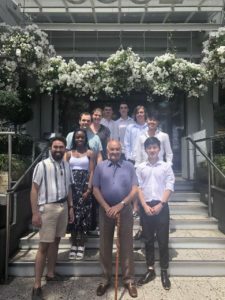 Businessman and philanthropist Sir Owen Glenn has invested in the education of nine high-achieving students in their second year of a business degree at the University of Auckland. “I’m immensely proud to contribute to the beneficial economic future of New Zealand by supporting the University of Auckland Business School and these exceptional students,” Sir Owen said. The students will spend time studying in China and the United States participating in a Global Business and Innovation Exchange Programme with students from the Chinese University of Hong Kong (Shenzen) and University of South Carolina (Darla Moore School of Business). This unique opportunity aims to build students’ international business capabilities and develop foreign language skills to support them in their future corporate careers. Scholarships were awarded on a combination of academic merit as well as leadership motivation and communication skills. The $135,000 scholarship donation will assist with their travel, accommodation and living costs for all nine students during their year abroad. Many of the student beneficiaries have expressed deep appreciation for Sir Owen’s support, as they would not have been able to participate in the programme without financial assistance. Prior to receiving his scholarship, Rico Su was hesitant to consider study programmes abroad due to limited financial resources, and he remarked that Sir Owen’s similarly humble beginnings inspire him to work hard to achieve success. “I know Sir Owen didn’t get the opportunity to go to university due to financial struggles when he was my age, but he did not let that stop him from being successful in business,” he said. Business School Dean Professor Jayne Godfrey says that this is a once in a lifetime opportunity that Sir Owen Glenn has generously provided for these students. “Building international capabilities provides a very real competitive advantage for our students and gives them the in-depth knowledge and cultural understanding that will help shape the future of business in New Zealand. Students will also strengthen life skills that are important for success in an ever-changing world of business,” she said. Sir Owen will initially fund the American component of this programme for the next five years.